The Duke Reporters’ Lab is seeking beta testers for FactStream, our new second-screen app that will provide live fact-checking during political events. On Tuesday, Jan. 30, the Reporters’ Lab will partner with PolitiFact, The Washington Post and FactCheck.org, which will provide FactStream users with live fact-checking of President Trump’s State of the Union address. 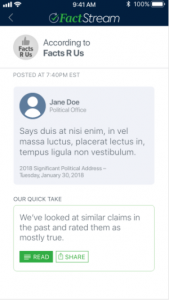 Throughout the speech, FactStream users will see pop-ups on their screen, alerting them to previously published fact-checks or real-time analyses of President Trump’s claims. 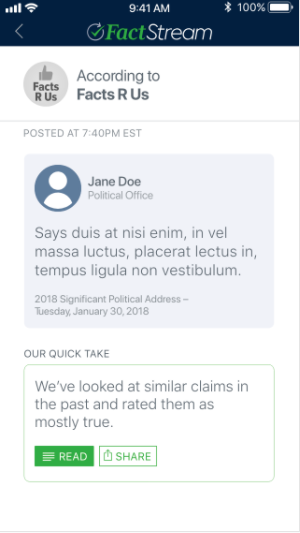 By pressing on a pop-up, users can read the full text of a fact-check, share the fact-check on various social media platforms or simply receive additional context about Trump’s statements. FactStream is a product of the Duke Tech & Check Cooperative, a $1.2 million effort that uses automation to help fact-checkers do their work and broaden their audience. Launched in September 2017, Tech & Check also serves as a hub to connect journalists, researchers and computer scientists who are doing similar work. The first iteration of FactStream is a manual app that requires the work of human fact-checkers behind the scenes. 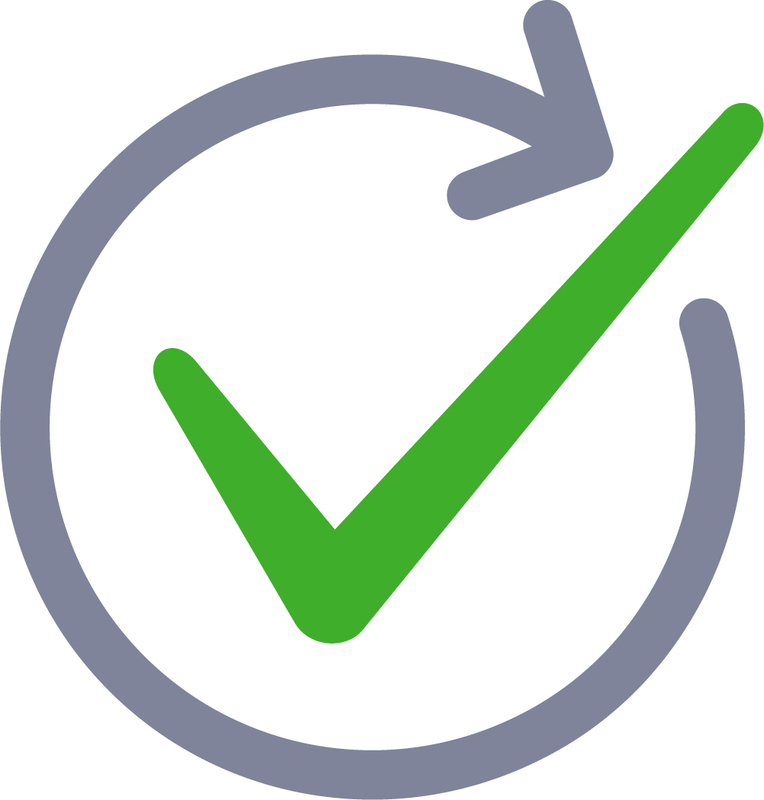 It is an important first step toward the “holy grail” of fact-checking — automated detection of a claim that is instantly matched to a published fact-check. (1) Download FactStream from the App Store. (2) Open and use the app during President Trump’s speech (Jan. 30 at 9 p.m. ET), making sure to test the app’s various screens and shared fact-checks. (3) After the speech is over, send us feedback about the app with this Google Form.